If you have something to say, say it BIG. 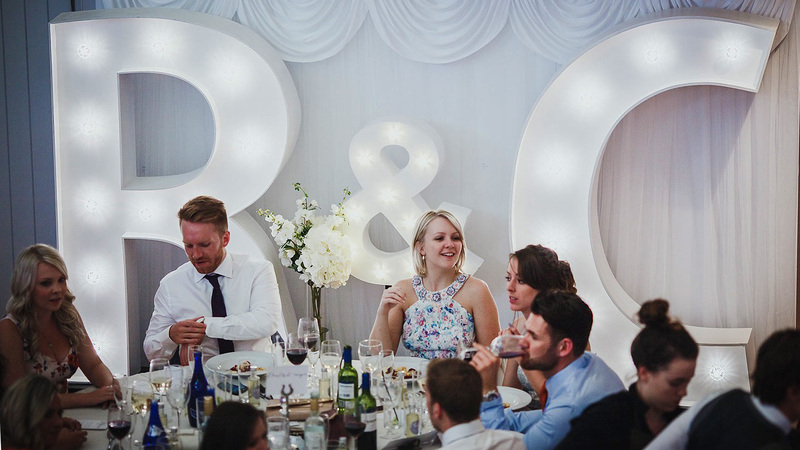 Our bespoke light letters allow you to be the talk of the town — Whether you are hosting your dream wedding reception or afterparty, a social occasion or corporate event, light up the scene by hiring these HUGE light up letters to make whatever words you want to say. We have all letters of the alphabet, plus numbers in a range of sizes ready to hire. If you want something extra special why not hire our giant heart archway which is sure to stun your guests on your perfect day. We also have a range of stars, hashtags and hearts to decorate your special event. 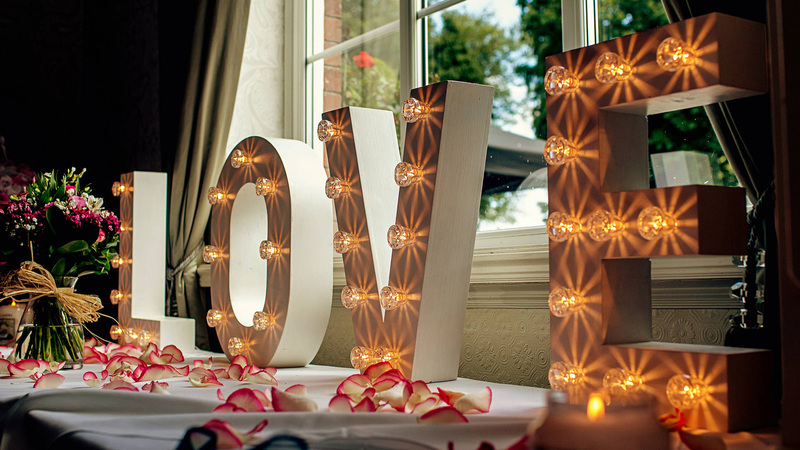 Our light up letters will help you give your event the WOW factor. The letters create a stunning focal point, a backdrop and a talking point, putting a smile on your guests' faces. Our giant light up letters make the perfect backdrop for your corporate event. You can either choose to make words from our stock of letters and numbers, or if you want something a bit more special you can hire us to create something bespoke - your company logo perhaps? We are Wales' light up letter specialists. Our light up letters, constructed at our joinery in Cardiff, UK, meet the highest standards of both safety and craftsmanship. Written in Lights began in 2013. 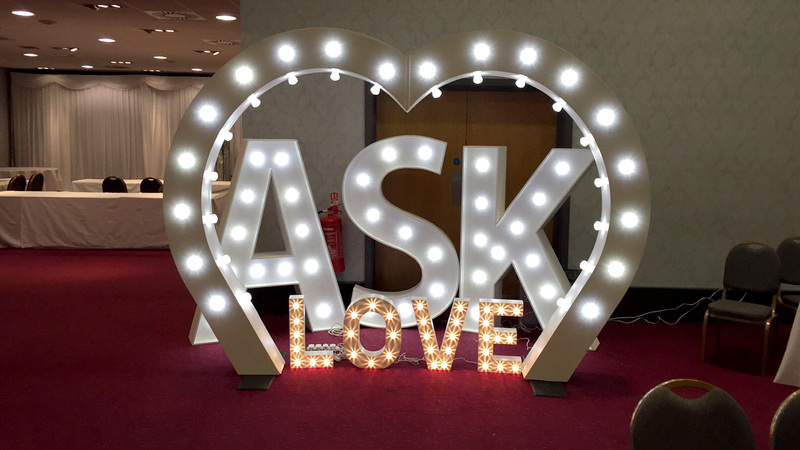 Harnessing over 32 years of woodworking and joinery experience our giant letters (1560 by 1300mm or 5'2" by 4'3") brighten up occasions such as weddings, parties and other special events. Written in Lights began as a project to source a giant 'LOVE' sign for a wedding. The owner of the business decided to construct them at his joinery workshop which traditionally specialises in staircases and windows. The quality of the signage was admired by many so he decided to make them available for events across Wales. 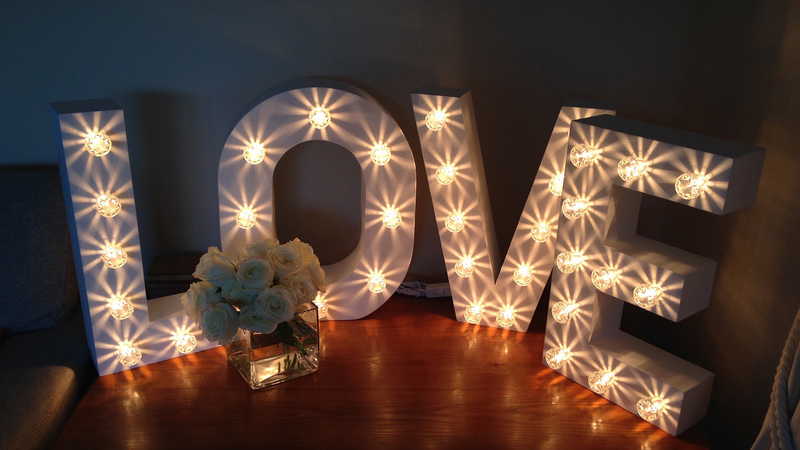 Are you looking for high quality light up letters for your perfect wedding, or party? We stock multiple copies of the whole alphabet, as well as love hearts, stars (in various sizes), and our huge heart-shaped archway! As well as every letter and our other beautiful shapes, we can build bespoke light letters and forms to order in our joinery workshop. 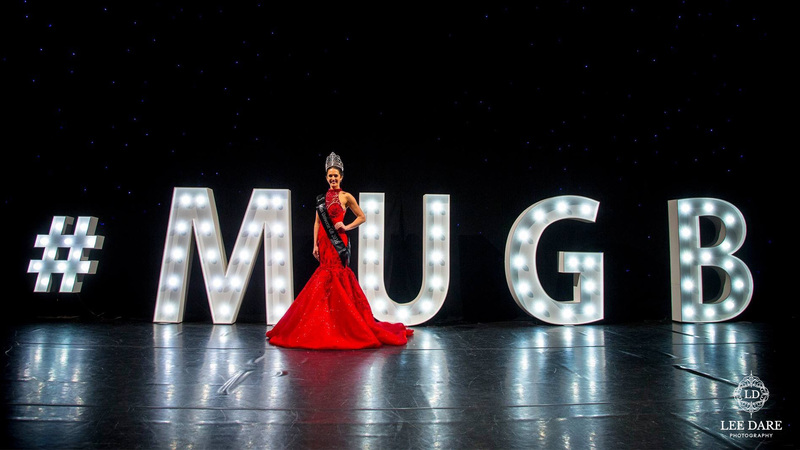 Our light up letters make the perfect backdrop for your perfect event, and are all hand-crafted in Cardiff to the highest specifications. Our giant light up letters (or Marquee letters) are the ideal statement piece for your corporate event. We can either supply you with letters from our stock range, or if you want something a bit more special, why not hire us to create a bespoke illuminated sign for you. We Aren't Just Big Words - Read Some Testimonials from Our Happy Clients! 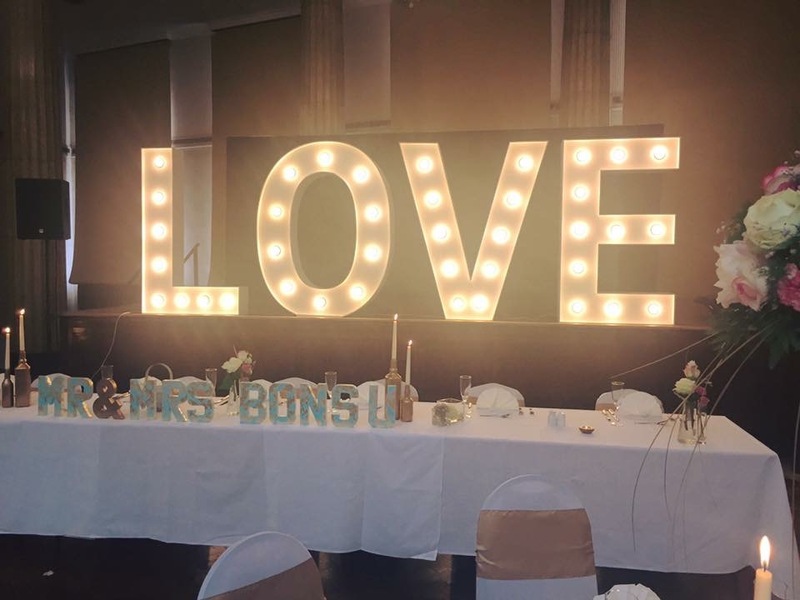 Want to say a massive thank you to Written in Lights for supplying us with the wonderful letters for our wedding day on 2nd July. They really added something to the day and have come out so well in the photos! The service was excellent from start to finish and we would highly recommend! An introduction to Written in Lights, what we do and how we got here. Lit Up By Our Letters? - Request A Call Back! Use the form below to request a callback.